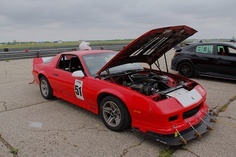 I have a returnless fuel system from the factory...since ive gone turbo, when im in the cornering on the track i am occasionally running out of fuel. whats the best way to intergrate a swirl pot? Use the stock pump to feed the pot & then run a stronger pump to feed the rail & run a return line? malibuguy said: Use the stock pump to feed the pot & then run a stronger pump to feed the rail & run a return line? Yup. Like that, you can put the swirl pot pretty much anywhere you like. You can also put the return line to the swirl pot if its easier. Many of the cars built in the early 80s used this technology. They didn't want to retrofit during the middle of a production run. They would use the same in tank pump that was used on carbed models to lift the fuel into the swirl pot. The swirl pot would use an in line high pressure pump. Return line would go back to the tank. Next model run would go to a high pressure in tank pump. Here's a picture of the arrangement on my motorcycle engine powered race car. One line w/ an inline fuel filter runs from the fuel cell pickup to the inlet of a Carter rotary vane pump, out to the inlet to the bottom of the swirl pot. The outlet at the top of the swirl pot returns to the top of the fuel cell and the Suzuki pump mounted in the bottom of the swirl pot is run to the fuel rail w/ another inline filter and tee-blocks for the fuel pressure sender and fuel sampling port. each pump is on a conventional 5-wire Bosch type relay with power from a switched side of the master power shutoff, and a dash switch as well. fanfoy wrote: ... you can put the swirl pot pretty much anywhere you like. You can also put the return line to the swirl pot if its easier. With all due respect... no, the OP has it right. The swirl pot is there to deairate the fuel and the proper place to do that is at the inlet to the high pressure fuel pump. Anywhere else it's deairating fuel that's not flowing to the engine, and there's not much point in that. Not sure what you're getting at. The concept is to use a low pressure pump to ~recirculate~ fuel from the tank to a constantly full reservoir and back to the tank. The high pressure pump feds from this reservoir. In my case, and that of many older cars with model runs that spanned the carburated and injected eras, it's an easy way to add a high pressure pump to an existing system. Specifically in my case, it's a car that pulls about 2 Gs cornering. The swirl pot system is about the only way to maintain consistent fuel pressure. kb58 said: With all due respect... no, the OP has it right. The swirl pot is there to deairate the fuel and the proper place to do that is at the inlet to the high pressure fuel pump. Anywhere else it's deairating fuel that's not flowing to the engine, and there's not much point in that. I don't understand what you are trying to say kb58. You're saying that what I'm saying is wrong, but there is no counterdiction? Dr. Hess, I have seen that article before, but that's pseudo-science BS. I've spent five years designing cyclones (same principals, different fluid) and I have never seen a swirl-pot on a car that actually functions as a swirl-pot. Most of them have a compromised design that makes them function more like a catch can. It's not as efficient, but it works in actual applications. To actually have a functional swirl, you need to know the precise flow, pressure, and Reynolds number of the fluid you are using and you can't compromise on the bottom outlet, and blah, blah, blah. Way too complicated for someone to accomplish in his garage. Op i know this doesnt directly answer your question and for that i apologize, but i'd like to offer the counterpoint that converting a returnless to a return style fuel system isnt the hardest thing in the world. I don't understand what you are trying to say kb58. You're saying that what I'm saying is wrong, but there is no counterdiction? Dr. Hess, I have seen that article before, but that's pseudo-science BS. I've spent five years designing cyclones (same principals, different fluid) and I have never seen a swirl-pot on a car that actually functions as a swirl-pot. Most of them have a compromised design that makes them function more like a catch can. It's not as efficient, but it works in actual applications. To actually have a functional swirl, you need to know the precise flow, pressure, and Reynolds number of the fluid you are using and you can't compromise on the bottom outlet, and blah, blah, blah. Way too complicated for someone to accomplish in his garage. The swirl is forcibly induced by using a tangential port to introduce the fluid at the top of the pot, such that it flows directly onto the pot wall. As the fluid spreads and follows the wall in a circle, centrifugal force causes lighter components (air, foam, etc.) 'rise', towards the center of the pot. Assume fluid Velocity at entry as 1 m/s, and pot diameter of 10 cm, so R=5 cm, that yields approx 20 m/s^2, about 2G. Double the fluid velocity, quadruple the G's. On dry sump oil systems, it also seperates out the metal debris to the wall, so clever placement of baffles and the tank pickup yields cleaner oil, while debris settles to the bottom for collection. 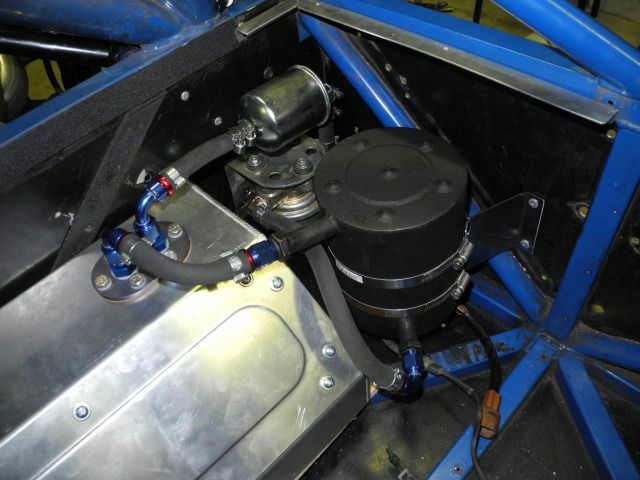 OK, engineer it how you wish, fanfoy, but Bill's swirl pot or sump pot or whatever you wish to call it works for him. I haven't corresponded with him in years now, but we discussed it in the past and it solved his fuel starvation issues and it also lets him know when he has however much is in the pot left for fuel on his race cars. The idea being not necessarily to remove air bubbles from the fuel, but to provide reliable fuel at all times on the track. Sorry to the OP for starting all this. All I'm saying is don't get too involved in the details, because there are a lot of "less than perfect" solutions out there that work great in real life.